I recently stumbled upon a photograph of this very unique piece of art that I had to find out more about it. It is a custom portrait by the artist Cheryl Sorg, and she sells them on Etsy. Each 2′ x 3′ portrait costs $400 and is handmade from paper, adhesive, engineering vellum, and mat board. 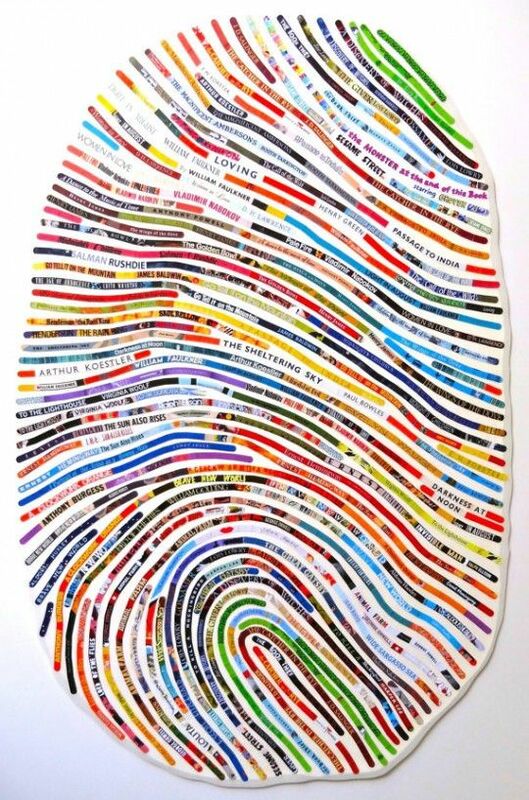 The coolest part is that each one tells the literary history of the person who owns the thumbprint. That’s right! You send Sorg your actual thumbprint on a card (she sends you the inkpad and cards to use), and then she transforms it into art. 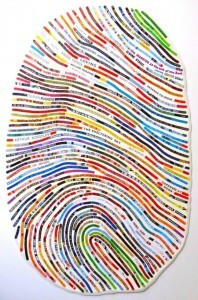 Each line of your thumbprint will contain the names of the authors you have read and the books by that author. I have to say that this is a reading lover’s dream portrait. If any of you out there need a last minute Christmas gift idea, this might be a truly terrific and completely unique gift idea. Now tell us what authors and/or books would you choose to add to your literary thumbprint. We can’t wait to hear what you would include!